Swordfish in Nova Scotia are caught using one of two different gear types: harpoons and pelagic longlines. Harpooned swordfish are killed one fish at a time. It’s a totally badass way to catch a fish. It’s also infinitely preferable from a conservation standpoint and creates a higher value, better quality, more marketable product. Harpooned fish can come with a significant price difference rewarding fishermen in a traditional fishery that has been practiced in Canada for over 100 years. The problem with longline fishing is the high bycatch levels caused by setting 30 to 50 miles of baited hooks out overnight. In fact, the Canadian longline swordfish fishery has one of the highest bycatch:target species ratios in Canada, and the industry has lobbied hard against meaningful bycatch restrictions. In contrast, fishing for swordfish by harpoon has virtually no bycatch: it would take a very poor shot and a very unfortunate turtle or shark to wind up on the end of a harpoon. 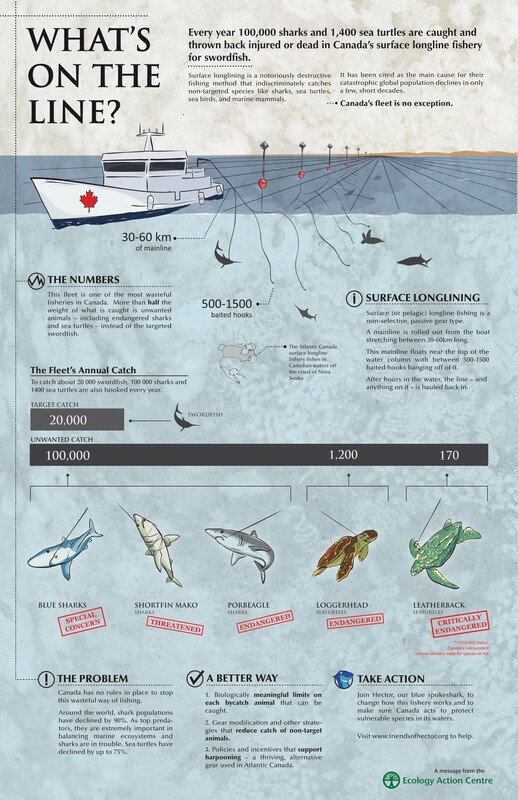 As the infographic shows (and Fisheries and Oceans Canada science confirms), the Canadian longline swordfish fishery catches 100,000 IUCN Red Listed sharks[i] and almost 1,400 endangered sea turtles[ii] every year, for about 20,000 swordfish. Post-release mortality studies (35% for the most common species, blue shark) show that 35,000[iii] sharks and 200-500 sea turtles[iv] are KILLED every year – approximately two times more ‘by-caught’ sharks are killed than swordfish. There are no scientific limits on the number of sharks that can be caught or killed. It would be possible to mitigate bycatch – through gear changes, bait changes, hook types, area and time closures, temperature restrictions, etc. – but there have to be regulations in place that require these changes. Right now there is a massive ‘environmental subsidy’ of being able to catch and/or kill an animal and discard it. Even worse, these figures are based on observer coverage of only 4 – 8% since 2006. Observer accuracy in this fishery is unknown; coverage has not been in a representative way. It just can’t be expected to generate reliable information about bycatch. How can we support sustainable fisheries? With two different gear types being used to catch the fish – one of which has clear environmental, quality and value advantages – our organization has worked to support and promote the harpoon swordfish fishery whenever possible. One of our biggest setbacks came in 2000 when a political deal was struck between the fisheries management and the longline industry lobbyists to divide the overall Canadian swordfish quota between the two fleets with 90% going to longliners and only 10% to harpooners (luckily longliners are allowed to harpoon their quota share if they want). Of course, as a political agreement, the quota split can always be revised if there is enough political will – and market demand. With marketing support from Fisheries and Oceans Canada and the provincial government, both fisheries entered Marine Stewardship Council assessment in 2009 and the harpoon fleets was quickly certified in June 2010. This made a difference. Over the next season, more swordfish was caught by harpoon in Nova Scotia and was more heavily promoted by high-end US retailers than previous years! It was a coastal livelihood win through certification! Exactly what the MSC is meant to accomplish! Huzzah! Unfortunately, this apparent success was short-lived. The longline fleet was also able to progress through the certification process – albeit slowly, and it now appears that both the long line and harpoon fishery will carry the same certification. As certification of the longline fleet started to seem more likely, environmental groups became more vocal. In April 2011, 35 marine conservation organizations from around the world sent a joint letter to Moody Marine and the Marine Stewardship Council, outlining reasons that the fishery should not be certified. Over 800 people contacted MSC Chief Executive Officer Rupert Howes directly, who refused to comment on an ‘ongoing process’. When the Final Report came out with a recommendation for certification, the Ecology Action Centre, the David Suzuki Foundation and the Sea Turtle Conservancy filed an official Objection (at a cost of 5,000 British pounds). You can read the Objection here (warning, it’s 36 pages of legalese) – and see how wide-ranging it is. We objected based on the sheer volume of bycatch, the low quality of data and monitoring, and technical definitions in the MSC standard – and we lost. Why did we lose? Incredibly, it’s not because we were wrong about something, but because the Adjudicator was required to show “deference to the Determinations of the Certification Body” rather than evaluate the scientific data and its interpretation. You can read the decision here and see how technical and legalistic it is; either the Adjudicator missed the point entirely, or his hands were tied by a process that favours the certifiers and their clients. With the Marine Stewardship Council squarely focused on the number of products certified rather than their conservation impacts, it seems clear that the process is broken – perhaps irreparably. Conservation groups like ours are left wondering: what’s next? What is the path to sustainable fisheries? The sustainable seafood movement is worse off by not having a trusted certification system to rely on, and unfortunately the MSC is actually the best certification standard there is. No retailers that have sustainable seafood policies will want to have products like this on their shelves and open themselves up to accusations of misleading eco-conscious shoppers. The Ecology Action Centre has told retailers about this situation and asked that they not carry Canadian longline-caught swordfish, regardless of the eco-labels they might carry. I don’t think this will be a hard decision for most. I sincerely hope that the MSC is able to get its house in order and become a well-respected, credible label that only appears on the best-managed and most sustainable fisheries in the world. Weak labels don’t help anyone. I would be happy to support the MSC if it makes changes to keep unsustainable fisheries out of its system. If that can’t happen, we have to ask: is there still a role for seafood certification? Were we better off without it? Reader mail: Sustainable shark finning? Culling, bycatch, and loopholes: three shark conservation petitions need your signatures! In California some of the commercial swordfishing fleet of gill netter allowed to fish as close as 3 miles from shore in a known Mako, Thresher, White, Blue and Salmon shark nursery with as much as 83% by catch also carry harpoon permits getting around the labels hence the possible east coast increase of landings by harpoon as well as harpoon swordfish pay as much as 2/3 more because of the fresh quality. They also opened their own restaurants ans sell directly to restaurants and on sportfishing websites to sportfisherman i believe are largely unaware of the destructive gear catch. They are also selling their catch at the docks like a farmers market certain days a week. The long liners are banned in the US EEZ 200 miles from shore here but we have mountains of data showing it’s the same fishery for pelagic species but they are still allowed to land their destructive gear catch inside the US and the government collects taxes from every pound landed. It’s my opinion profits driving politics always trump conservation with government support and there is no end is sight of mans poor stewardship of sustainable fisheries and government greed and organisations corruption but there certainly is and end in sight of sustainable fisheries. i have tagged and released over 4000 makos threshers and salmon sharks on my own vessel and have long lined here with the state of California tagging and releasing sharks when i invented the first shark sling many agencies like NOAA have adapted. We were using longlining gear only a few miles long with 4 hour maximum soak times and released almost every fish alive with a tag and i showed them how to set the hooks in a manner that reduced the mortality rate to near zero. With so many countries competing for the pelagic resources like the world war land grab greed the future looks grim given mans nature of greed trumping sustainable harvest with incredibly destructive gear out of sight or if it was insight of the public i believe things would be different that is why i believe every vessel destructive gear should be monitored with video monitoring to display to the world the reality of the destruction in a manner they can see rather than the manicured glorifying crap like shows of destructive gear on the backs of greedy commercial fishermen in perfect storms who seemingly died out of greed. This is a really poor decision by MSC and a real shame for marine conservation. We need a strong certification scheme we can trust in and decisions like this put a massive question mark over MSC, I for one am losing faith. How can a fishery be sustainable when the “bycatch” is so much larger than the target catch, and even more so when that “bycatch” is vulnerable species. Fisheries with such negative impacts must pay a penalty so that more sustainable fisheries become economically advantaged. A level playing field for such differing impacts makes no sense at all. The majority of consumers are led by price, unsustainable fisheries need to be priced out of the market which is only right, they should pay for the damage they cause. This would force them to adopt sustainable practice and guide consumers to the right product as it would be cheaper. As the person responsible for managing the MSC certification project for both the Canadian harpoon and longline fisheries, I find I must correct some of the statement made by Jordan Nikoloyuk of the Ecology Action Center that were not quite factual. While the division of the Canadian quota between the two fleets may have been political, the process was brought about out of a necessity to rationalize the Canadian fleet to match available quotas of the day. The 90% – 10% split was somewhat based on historic catch levels from the previous 30 years, with harpoon history being 5.6% of the Canadian catch and longline being 94.4% over that time period. The harpoon fleet received almost twice its historic share, an amount that they had only caught twice in the previous 30 years. I would say that the “politics” favored the harpoon fleet. Following the split, the longline fleet cut the number of active vessels in half, while the harpoon fleet tripled in size. Guess they did not understand the requirement to match fleet size with available quota. What the Ecology Action Center fails to recognize is that recovery potential assessments have been conducted, with their participation, for all of the species that they have issue with. These assessments were considered by the team and the peer-reviewers that conducted the assessment of the Canadian longline fishery. These recovery potential assessments are a part of the requirement in Canada for any species that is recommended for potential listing under the Species at Risk Act. In every case, not only was the take in the Canadian swordfish longline fishery found to not hinder the existance or recovery of any of these species but that the Canadian catch from all fisheries did not hinder the recovery or rebuilding of any of these species. In other words, the current harvest levels were SUSTAINABLE. Mr. Nikoloyuk also suggests that there are no gear restrictions, no time area closures, and that the Canadian longline industry has done nothing to address by-catch in this fishery. Here, he is outright misleading his readers, he knows that there are in fact several time area closures in this fishery to protect sensitive species, he knows that this is a circle hook only fishery, to reduce harm to incidental by-catch, he knows that the fleet carries and has been trained in the use of safe handling and release equipment to safely release unwanted by-catch. Another point that Mr. Nikolyuk fails to mention is that prior to the recovery potential assessments for both porbeagle and mako sharks, discards by the longline fleet we nil but groups such as his and the scientists taking part in these asseessments suggested that this fleet should release live porbeagles and makos when practicly and hence what he now calls discards, actually live releases. This fishery was examined against the same stand as every other fishery that has chosen to measure itself against the MSC standard, by an independant team of experts and peer-reviewers and included input from interested stakeholders. In this case an independant adjudicator found that based on the evidence presented, that the certifiers decision was correct and that the process had been followed correctly. Both the Canadian harpoon and longline fisheries are sustainable, making Canada the first country to be able to offer their entire swordfish catch with the MSC blue check mark logo, demonstrating the Canadian industry’s commitment to sustainability. Myself, I would like to thank Mr. Nikoloyuk and his associates for taking the time and energy to participate in the MSC assessment process. There can be little dought now that this fishery is indeed sustainable as it has been examined under a very powerful microscope in every detail. I’m really happy with the responses to this post in the comments here and in other forums. I’ll try to respond to all of the issues with the comment above. Apologies if I miss anything. The harpoon fleet received almost twice its historic share, an amount that they had only caught twice in the previous 30 years. I would say that the “politics” favored the harpoon fleet. Some people have entire careers built on arguing over quota distribution, and I don’t think it’s useful to rehash it here. It’s true that after longline fleets started fishing in the 1960s and the swordfish stock declined, harpoon fishermen caught fewer fish as the more ‘efficient’ longline fleet’s catches increased. On the other hand, harpooning was here first, and there were decades where 100% of the quota was harpoon caught – peaking around 4000 metric tons in 1959, which is more than the whole Canadian quote now. I think the best principle would be to allocate quota to each fishery according to its negative ecosystem impacts, and work from there, rather than to argue about which years should form “the History”. After all, the fish belong to the people, and there’s no reason for quota distribution not to reflect environmental priorities as well as industry lobbying. In every case, not only was the take in the Canadian swordfish longline fishery found to not hinder the existance or recovery of any of these species but that the Canadian catch from all fisheries did not hinder the recovery or rebuilding of any of these species. In other words, the current harvest levels were SUSTAINABLE. This point reveals a huge flaw in the MSC standard, and I guess I can’t a fishery for taking advantage of it. When the standard measures whether “the Canadian fishery hinders the existence or recovery” of a species, it looks at the marginal contribution of the fleet. The standard basically asks: if all other sources of mortality dropped to zero, would the species’ recovery or existence be threatened by this fleet? If not, then the fishery passes. It’s also important to consider the quality of data being used to make these conclusions, and I would argue that stock assessments for ocean-ranging shark species are often unreliable and data-deficient. I would prefer to see the MSC use a precautionary approach as they claim to. Mr. Nikoloyuk also suggests that there are no gear restrictions, no time area closures, and that the Canadian longline industry has done nothing to address by-catch in this fishery. Here, he is outright misleading his readers, he knows that there are in fact several time area closures in this fishery to protect sensitive species, he knows that this is a circle hook only fishery, to reduce harm to incidental by-catch, he knows that the fleet carries and has been trained in the use of safe handling and release equipment to safely release unwanted by-catch. It is true that there are some management measures in this fishery that affect bycatch animals. For example, two areas are closed to long liners specifically to help protect bluefin tuna. The fleet also started using only 16/0 circle hooks last year (though not the 18/0 circle hooks considered best practice for sea turtles and used in the U.S. NED fishery for the same species) . The fleet also carries and has been trained in the use of safe handling and release equipment, though it is important to me to note that USING the equipment is voluntary and can be time-consuming. These measures haven’t reduced the bycatch numbers I cited in the post. Mr. Atkinson and I were actually at a meeting recently where one analysis of the data showed an INCREASE in turtle mortality from the introduction of these safe handling and release kits. The proper conclusion is that there is insufficient data to show whether these measures are making a difference for turtles. I think that there are two different issues to argue here. The first is whether or not Canadian management should allow this fishery to operate as it does, with a few measures and restrictions in place but a high number of ‘bycatch’ animals being caught and killed. In that argument, Mr. Atkinson’s points may be relevant – the fishery isn’t doing nothing. The second argument is whether or not this fishery deserves an ‘eco-label’ of environmental excellence, and in that argument, I think the numbers are all that matter. There are a variety of measures – some partially in place, some not at all – that could be used to bring those numbers to a scientifically determined, biologically meaningful limit if one was set. Another point that Mr. Nikolyuk fails to mention is that prior to the recovery potential assessments for both porbeagle and mako sharks, discards by the longline fleet we nil but groups such as his and the scientists taking part in these asseessments suggested that this fleet should release live porbeagles and makos when practicly and hence what he now calls discards, actually live releases. I think that the point being made here is that if the fleet retained all of the sharks they caught, there would be no ‘discards’ that they could be criticized about, and I suppose that is true. What my organization has asked for – and continues to ask for – is for every species being caught to have precautionary catch limits based on meaningful scientific assessments, and for those limits to include discard mortality. I have trouble with the term “live release” because it implies that the animal always lives, but we know that’s not true. Post-release mortality rates for some species can be quite high. This isn’t really true. As I explained in my post, the adjudicator found that the process has been followed, but he didn’t examine whether the decisions were correct, or the evidence properly used. In this case, 35 marine conservation organizations and experts have signed an open letter to MSC to not certify this fishery (a href=”http://www.friendsofhector.org/open-letter”>http://www.friendsofhector.org/open-letter ). The independent experts Mr. Atkinson mentions are the ones employed by the Certification Body hired by Mr. Atkinson’s fleet to assess them. There can be little dought now that this fishery is indeed sustainable as it has been examined under a very powerful microscope in every detail. I still doubt it, and I’ve seen a lot of reactions from other people who do as well. That’s what I wrote this post to talk about.